If you’re at all familiar with pleated curtains, then you’ve probably heard the term ‘pencil pleat’, so named because of the gathered heading, whose folds are pencil-thin. Pinch pleat differ from pencil pleat because they offer a more tailored finish than other types of curtains, resulting in a more formal look. So how do pinch pleat curtains work? Well, unlike their pencil pleat equivalents, pinch pleat curtains cannot be adjusted to fit the size of your windows. They instead come in fixed sizes, which are multiples of the span of each pleat. As such, it’s sometimes tricky to match them with non-standard sized windows in older properties. Single pinch pleat is the most common variety of pinch pleat curtains. It’s also known as the ‘New York pleat’, and relies upon evenly-spaced folds, sewn into the fabric of the header to create a rigid, uniform style. It’s simple and elegant, and a great match for smaller windows. Inverted pleating takes much the same approach, except in reverse. The pleats are at the rear of the curtain, allowing the fabric to hang down in wider rolls. Double pinch pleat requires that the folds be bunched together, creating a row of ‘v’ shapes at the top of the curtain. Since there are more folds, this requires more fabric, which creates a fuller curtain. It’s also known as ‘Dutch’ pleating. Triple pinch pleat takes the concept to another level. Instead of two folds to each cluster, you’ll get three. Each trio of folds creates a fan shape, resulting in a voluminous curtain that’s well-suited to more formal interiors. Figure out how long your curtain rod is. The rod should be longer than the window itself, allowing the curtains to be drawn entirely beyond the window, allowing the maximum light to flow through. This ‘stacking area’ to each side of the rod should be around 30% of the width of the window. Calculate the width of curtain you need. It’ll need to cover the entire width of the rod. If you have a pair of curtains, then you’ll need to allow a couple of extra inches on each curtain. That way, they’ll overlap in the centre. Determine the width of your curtain. The curtain rod should sit approximately four inches above the window so that it’s entirely concealed when looking in from outside. If you want your curtains to fall to the windowsill, they’ll need to be a few inches longer than the sill to obscure the hem from outside the building. If you want floor-length curtains, subtract an inch to stop them from touching the floor. Looking for new curtains? 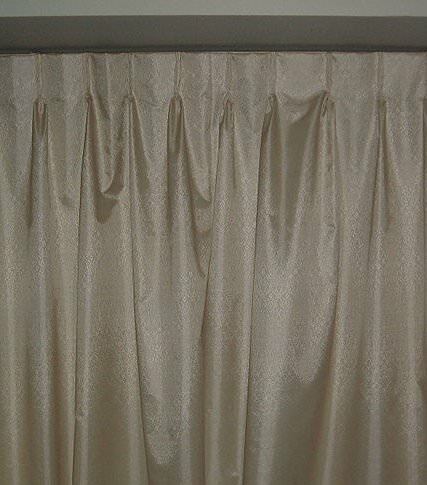 View our pencil pleat curtains, eyelet curtains, tab top curtains or slot top curtains.